Since the release of their 2013 debut 'Lay Your Dark Low', Scottish band Salt House have established themselves as a strong force on the folk scene. Known for their combination of new writing along with reworking of old words, their sound is rooted in the rich British song-writing tradition. This very talented trio was previous winners of BBC Young Folk Awards and have also won a Scottish Jazz Award. They will be releasing their exciting latest album 'Undersong' on the 2nd February. Produced by folk scene heavyweight Andy Bell (Martin Simpson, Songs of Separation, Furrow Collective) the album instills a special sense of place, recorded in a restored Telford Church on the island of Berneray, Outer Hebrides. Whether its setting old words to new melodies, re-working ancient ballads or writing their own, Salt House marry all their musical strands with a deep understanding for the British song tradition and an empathy for a story. 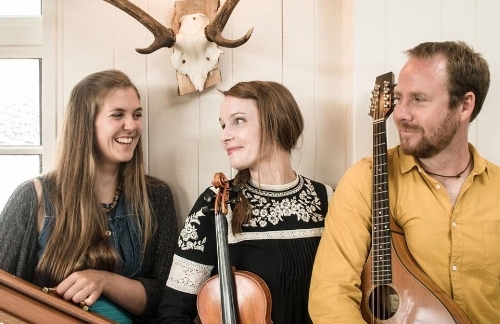 Recent recruit, singer-songwriter Jenny Sturgeon joins multi-instrumentalist and songsmith Ewan MacPherson and violist and fiddler Lauren MacColl to weave stories of landscape, place and time.